Let's face it. Share application forms can be a nuisance to complete. Typos and illegible handwriting can cause delays in acquiring your shares. Raisebook's platform provides entity storage for multiple entities. Raisebook automates the filling in of application forms based on the entity you choose, so you never have to worry about typos again. Raisebook strives to make this process as painless as possible, however you need to supply us with the correct information when you are completing the form. Share application forms require you to complete with the details of the entity that will be holding the shares. This includes: Entity Name, Address, ABN or ACN (if applicable), HIN, TFN (if applicable) and number of shares applied for. A contact name and details are also required. The application form will include instructions on how to complete the form. We recommend always following the form's instructions as different forms may have different requirements. Raisebook simplifies this process by ensuring your chosen entities' details are copied directly to the form. After placing a bid on Raisebook you will need to complete a share application form to finalise your bid. What follows is a step by step guide to completing the online share application forms on the Raisebook platform. If you're after an introduction to completing application forms see our article here. 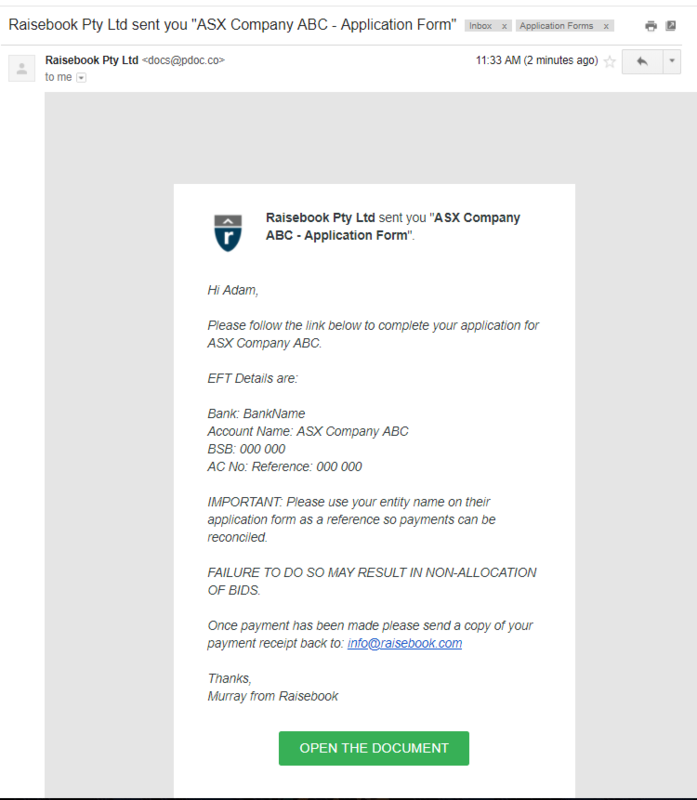 Subject will be: Raisebook Pty Ltd sent you "COMPANY.NAME - Application Form"
Read the instructions on the email and click Open the Document. If the application process is different to the below, the details will be included in the email you have received. If you have any issues contact us at info@raisebook.com.